Blog Quick Quotes: Use that Stash with Kathi! Use that Stash with Kathi! Welcome, it's Kathi hosting the blog and thanks for joining me today. Today I am sharing two single 12 X 12 layouts. Each layout has memorabilia. Page 1 is a layout of the 1973 Inaugural parade. A town in Northern Idaho - Lewiston Idaho was invited to participate in the inaugural parade. It was my junior year of high school. The large photo is of the entire marching band, drill team and dance squad." The memorabilia is the flyer of the inaugural parade which flips up to reveal the rest of the photo's. The paper lines used are older paper lines from my stash, Andrew Avenue and Julie Je T'aime. 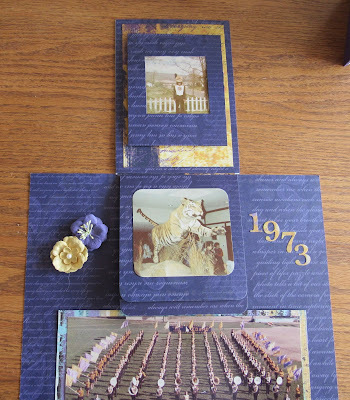 The photo of the tiger was one of the displays at the Smithsonian Museum. We toured the Capital, the Washington Monument and the White House. We ended out trip in the big apple "New York City". Close up of the flyer. My tassels from graduation, a mini copy of my graduation announcement. Also photos from graduation night, and the front of the high school.